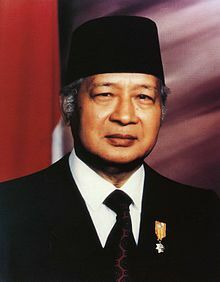 ↑ Soeharto, as related to G. Dwipayana and Ramadhan K.H. (1989), Soeharto: Pikiran, ucapan dan tindakan saya: otobiographi (Soeharto: My thoughts, words and deeds: an autobiography), PT Citra Lamtoro Gung Persada, Jakarta. আইএসবিএন ৯৭৯-৮০৮৫-০১-৯. ↑ David A. Blumenthal and Timothy L. H. McCormack (2007). The Legacy of Nuremberg: Civilising Influence or Institutionalised Vengeance? (International Humanitarian Law). Martinus Nijhoff Publishers. আইএসবিএন ৯০০৪১৫৬৯১৭ pp. 80–81. ↑ Tempo (Jakarta), 11 November 1974. ↑ McDonald (1980), p. 10. ↑ McDonald (1980), p. 14. ↑ Vickers (2005), pp. 203–207. ↑ E. Aspinall, H. Feith, and G. Van Klinken (eds) The Last Days of President Suharto, Monash Asia Institute, pp.iv-vii. Benedict R. Anderson en Ruth T. McVey, A Preliminary Analysis of the 1 October 1965 Coup in Indonesia (Cornell University, 1971). John Roosa, Pretext for Mass Murder: The 30 September Movement & Suharto's Coup D'état. The University of Wisconsin Press, 2006. আইএসবিএন ৯৭৮-০-২৯৯-২২০৩৪-১. Legacy of Ashes: The History of the CIA, Tim Weiner. Doubleday, New York 2007 (আইএসবিএন ৯৭৮-৩-৫৯৬-১৭৮৬৫-০), chapter 15, CIA and Indonesia.